Having a coherent SEO monthly plan is all part of running a successful SEM strategy for volume (hits) and value (cost/revenue). 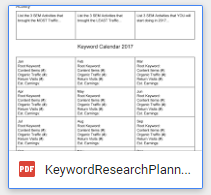 This free PDF resource provides an SEO strategy plan template that both looks to the results of 2016 and helps to look forward into 2017 with a monthly breakdown. To fill it out, I suggest you get a pen -- yes, a real pen -- and write on a printed copy: preferably expanded to A3 and stuck on your wall near where you work. Actual physical writing helps with personal engagement and accountability; and the higher quality the pen, the more successful the process will be. Keyword Calendar - 12 months of stats relating to ongoing SEO/SEM activities. The idea is to follow startegic management theory and use the past to inform the furture whilst developing new insights from managing and applying your resources (keywords and content). bounce rate - how many clicked away without engaging. These numbers will have different meanings for different people. For example, this site has a low bounce rate (high engagement) and reasonably high return visit rate. Traffic, though, is considered to be low -- by comparison to other blogs. However, other client's sites are the opposite: mainly because they are keyed towards getting lots of visitors to take immediate action, which takes them straight out of the site and off to the order page provided by their partners! Keyword Phrases - how they find your site. The PDF suggests listing the Top 5 in each category, but feel free to add more. The point is to know whether the site is delivering the value that you expect. If you are an affiliate for (say) 5 products, then you'd expect the "landing pages" to list high, as well as the pages that take the consumer away to a third party order page. You could consider swapping the idea of an "Exit Page" for an "Exit Link", if that's the case. This section starts to bridge 2016 into 2017 by looking at activities that worked, those that didn't and new ones that should help to improve your SEM either by volume or value. If you catch yourself doing something that you did last year 'just because', then you should probably swap that task for one from the third column. On the other hand, if you feel that you are neglecting the first column, then take moment each week to address that. This section is both an action plan, and a reminder! The Calendar is an attempt to help you plan tour SEO and keyword research activities for the year ahead. Those with multiple sites, will need multiple PDFs: that's okay -- print as many as you need! Each month, you want to note down a new Root Keyword to create content for or research around. Set these out by quarter if need be, but try to at least have an idea of what should go in each month: use the Keyword Planner and publishing schedules from niche magazines (for example) to pick out seasonal trends. Then, each month note the number of Items presented, how much traffic was generated, and what the Return Visit percentage was. Also, note the Estimated Earnings for that month, from that site. It's to be hoped that the annual trend is upwards, or some course correction will be in order! The free PDF can be downloaded on this special SEO, SEM and KWR planning page. If you find it useful, be sure to share this resource using the social share bar below.